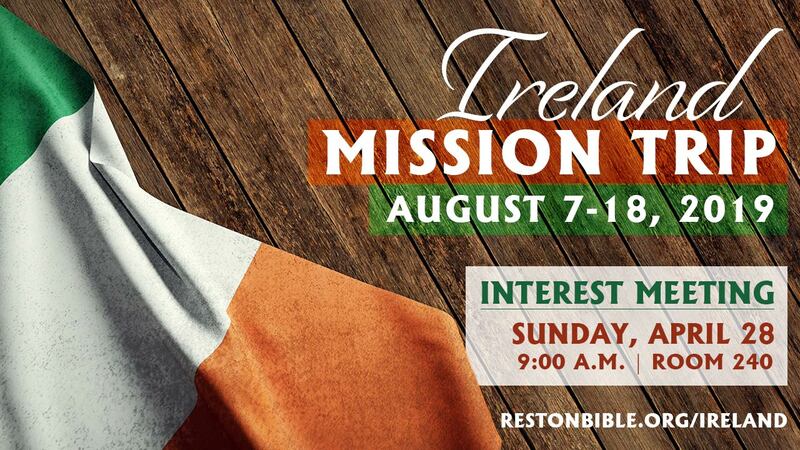 RBC desires to send a team of primarily young adults to Ireland to bless RBC missionaries Steve and Julia Blanchard and Bryce and Carolyn Carlaw, to assist them in their church planting ministry in the town of Passage West. The team will serve by helping with an evangelistic youth soccer camp (no soccer experience required), cleaning, and painting the community center where the church gathers to worship. There will be other activities to connect with young adults and families and share the love of Christ. The tentative dates for the trip are August 7 to 18, 2019. We are looking for team of 10 adults, and the cost will be approximately $2,200 per person, depending on final logistics. To learn more about this trip, please attend the interest meeting on Sunday, April 28, at 9:00 a.m. in Room 240. Please don’t let financial constraints keep you from attending the interest meeting — we will discuss fundraising activities. Please contact Noah Smith with any questions at noahsmith721@gmail.com or 703-303-7225.